In the old village of caves called Khndzoresk in Syunik region, people lived in caves until 1950. It is said that the last person left the cave in 1958. Now the cave delight many tourists and wonder how far the human imagination can reach. This place, which we can say that a man took from the nature maximum. Khndzoresk with its natural stone pyramids transport us to a distant era when there were giants. Despite its small size, Khndzoresk rich in historical and cultural values. 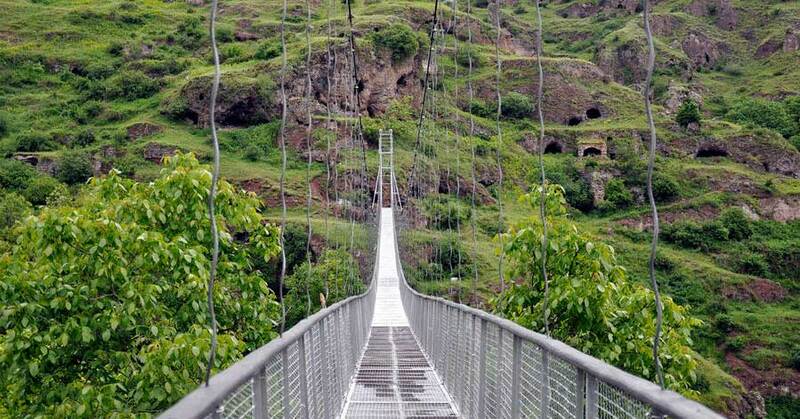 The most famous is the swinging bridge. To achieve this goal you have to go to paradise path about 15 minutes. The bridge was built by local residents. Length 160 meters, 63 meters maximum height and 14 tons in weight. An ideal place for lovers of adrenaline.